Context: Curious accretions of paper snippets and bits of transparent adhesive tape can be found all around the cobbled streets of Regensburg’s Old City, on vacant buildings, street furniture, poles or drainpipes. 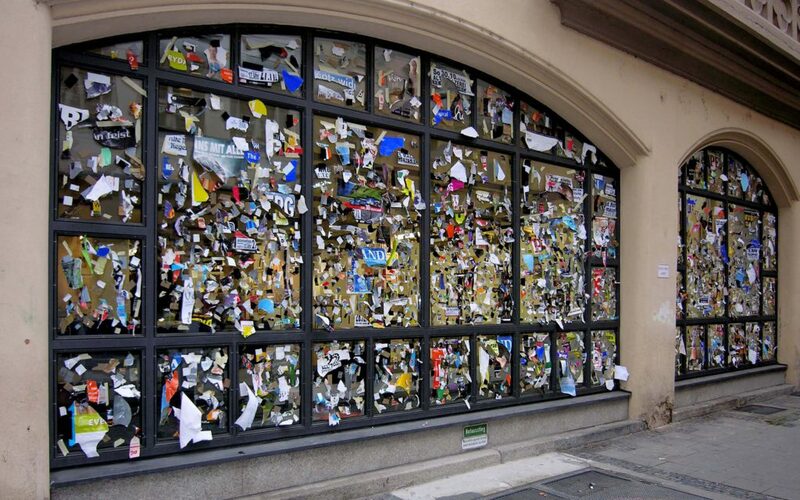 Upon closer inspection, they appear to be the remnants of notices and posters put up by non-profit or small-scale organisations announcing music gigs or exhibitions, calling attention to political initiatives or promoting charities. 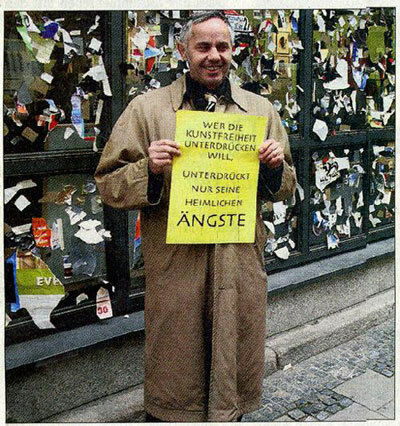 Like so many other cities where public space is increasingly marketed and privatized, Regensburg has banned fly posting, and has put up official, commercially exploited poster spots at designated areas – white advertising columns, where space is sold at commercial rates. Every day, the local sanitation squads go around the city to remove flyers and posters from illegal spots. But the clearing of the city from the clutter of unwanted messages and visual distraction paradoxically seems not to be done very thoroughly. 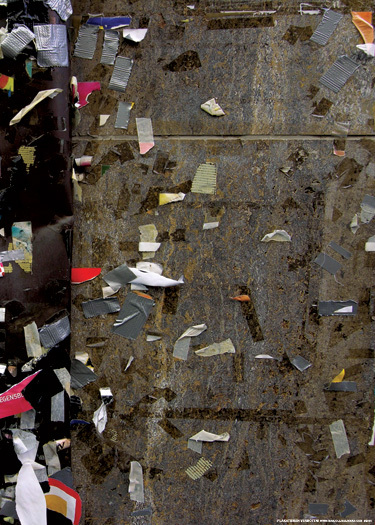 The bits and pieces remaining from crudely ripped-off posters form a strong picture in themselves. They seem to be the silent signs of a daily battle. 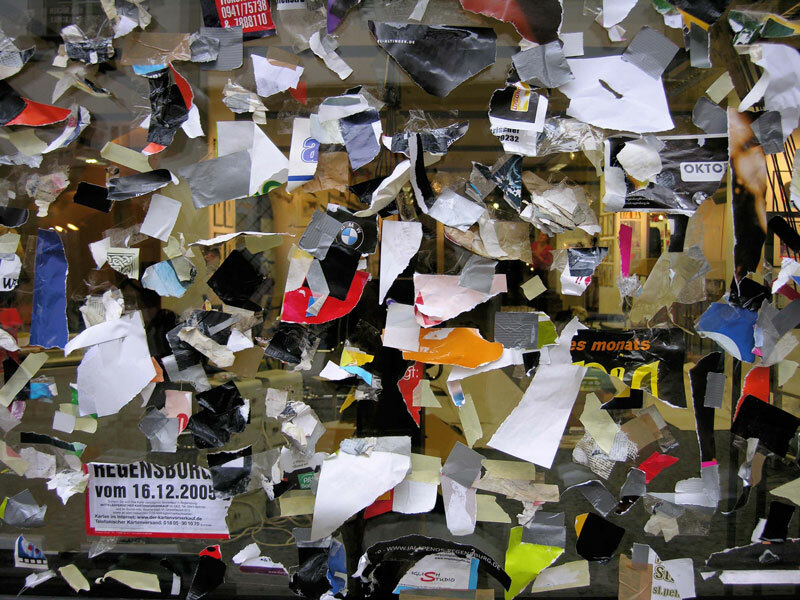 Rather than contributing to a clean and orderly, picture-perfect city image, the torn scraps give the impression of a rather aggressive relation between government and citizens, which provokes questions about the mechanisms that regulate and censor the information that appears in the public domain.